It turns out that my intuitive “yes” is about right. Why that intuition? Simple. There are two big bathtubs involved: the stock of CO2 in the atmosphere and the stock of heat in the global system. Emitting CO2 fills the atmospheric bathtub, and CO2 in the atmosphere traps heat that warms the global system. The CO2 bathtub takes more than a century to drain back to its preindustrial state (possibly millennia if temperature feedbacks kick in). The heat bathtub takes decades to respond as well. Thus one would expect the response to a change in emissions to take a long time to observe. 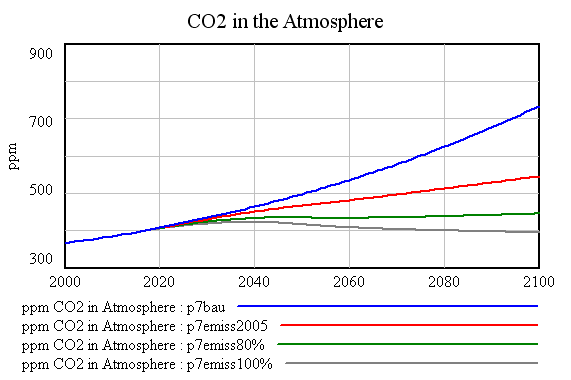 I ran a few simulations with the simple emissions-carbon cycle-climate model (“Pangaea”) that we used in the war game. The blue scenario (ironically warmest) has business-as-usual emissions (rising to a modest 23 gigatons carbon per year by the end of the century). 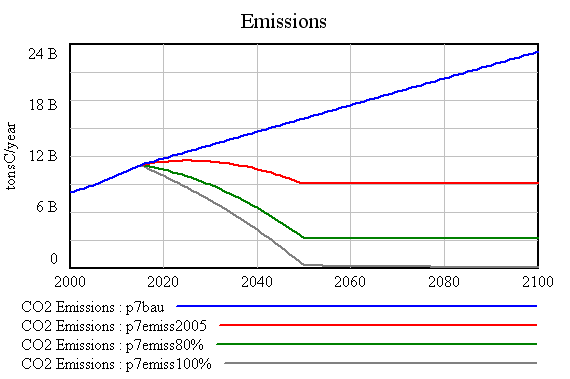 The red scenario stabilizes emissions at 2005 levels, starting gradually in 2015. The green scenario stabilizes 80% below 2005 levels, again starting in 2015 with full implementation by 2050. The gray scenario eliminates all emissions by mid-century (including land use emissions, which remain at BAU in the others). 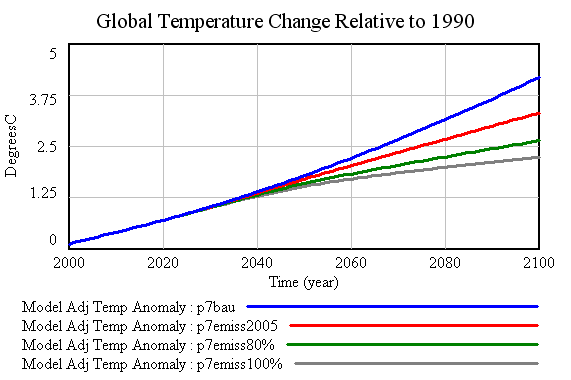 As you can see, qualitatively there’s not a lot of response in temperatures by 2050, so yes, we’re locked into some warming. I’d note though that the difference is about .26 degrees C, which is not trivial, especially to ecosystems and high latitudes (where polar amplification occurs). By 2100, the change is marked. The absolute difference in temperature is 2 degrees C. That’s huge from an impact standpoint; impacts are typically modeled as rising quadratically or exponentially with temperature. Equally important, the rate of rise is much lower, and the rate has a lot to do with the capacity of species to adapt and human systems to cope. Actually, there’s a third important bathtub, implicit in the scenarios above, which is the stock of carbon-consuming capital in the economy. I implemented emissions reductions gradually, because doing them overnight would essentially mean turning off the economy. The lifetime of carbon-consuming capital (power plants, cars, roads, buildings, appliances) puts a bound on the rate at which emissions can be reduced without abandoning existing capital. For example, if power plants last 40 years, and we never build another one, just using the existing ones implies emissions falling by 1/40 = 2.5% per year. That’s not fast enough to reach the most aggressive emissions cuts above. That’s why it’s so critical to start building the kind of economy we’d like to have in 2050, now.